A new book by historian of the left, Toby Boraman. 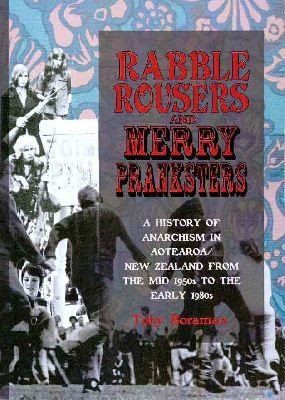 Rabble Rousers and Merry Pranksters captures some of the imagination, the audacity, the laughs and the wildness that animated many of the social movements of the sixties and seventies in Aotearoa/New Zealand. During this time, particularly from the late sixties to the early seventies, an astonishingly broad-based revolt occurred throughout the country. Thousands of workers, Maori, Pacific people, women, youth, lesbians, gays, students, environmentalists and others rebelled against authority. Innovative new styles and anarchistic methods of political dissent became popular. A colourful and energetic bunch of anarchists occasionally played significant roles in these struggles. Anarchists were prominent in the anti-nuclear, anti-Vietnam War, anti-US military bases, commune, unemployed and peace movements. Rabble Rousers and Merry Pranksters is a richly-detailed tale about a much neglected anti-authoritarian leftist current in Aotearoa/New Zealand history. Rabble Rousers and Merry Pranksters will interest not only anarchists and other libertarian socialists, but also those just interested in what happened in the sixties and seventies. The book includes a broad-ranging overview of the protest movements and social context of the time. It challenges the liberal orthodoxy of most New Zealand historians that writes class struggle out of history. • The worker-student siege of parliament in June 1968. • The death of anarchist punk rocker Neil Roberts while he attempted to blow up the Wanganui police computer in 1982. • The “Jumping Sundays” or the liberation of Albert Park in Auckland in 1969, a spontaneous free festival involving thousands of people. • The Mount John “rock festival” of 1972, when anti-US military bases protesters sabotaged the only access road to the Mount John US Military Installation. • The 1974 ferry case when a near general strike spontaneously occurred over the imprisonment of union official Bill Andersen by the Labour Government. • The anarchist involvement in the formation of Peace Movement Aotearoa and the successful Save Aramoana Campaign, a seminal ecological struggle. • The legend of Bill Dwyer, an anarchist firebrand whose “illegal” activities, such as selling LSD/acid, were designed to further the anarchist cause. • The firebombing of the Christchurch American Consulate in 1973 by a couple of anarchists. • And many more events, groups and movements! The book is a pioneering work. It represents the first major history of anarchism in Aotearoa/New Zealand. It is primarily based upon interviews and correspondence with participants in the libertarian socialist scene. It also draws upon extensive research into unpublished manuscripts, documents, magazines, leaflets and other ephemera written by anti-authoritarians. To capture a little of the distinctive and colourful political style of the period, over 100 images are included in the book, including cartoons, posters and leaflets. I've got a wee soft spot for anarchists. At least they believe in freedom, even if they do leave out the responsibility bit. Might even check out the book myself. But they dont believe in freedom, most anachist that I read about dont even beleive in real anarchy. They are very commo like from what I can tell, seem to be more like disorganised commos. dont seem to like capitalism. Excatly comrade!. It seems that anarchists only really oppose 'right' authority, but don't really care about leftist totalitarisim. The red flag waves beside the black. Most of the anarchists I've had to do with over the years are just really rebelling against their parents. "but don't really care about leftist totalitarisim"
Eh? Do some more research - anarchists were among those who most eloquently spoke out against the Bolsheviks in Russia, for example (see My Dissillusionment With Russia by Emma Goldman for but one example), while Ukrainian peasant anarchists fought simultaneously against both the Tsarist Whites and the Bolshevik Reds. "anarchists and other libertarian socialists" You cant be too freedom loving or libral if you are socialist. MOT, the word libertarian was used to describe anarchists decades before the ultra-capitalist right ever laid claim upon it. It doesnt matter who uses what word, socialists are not freedom lovning. Just cos anarchists don't like countries having borders and dislike authoritarians, that does not make them pro freedom. To not allow capitalism is to not allow freedom. Capitalism is based of freedom of choice. capitalism is based on freedom of choice? Can I choose to be a communist then? If I can convince all my mates to be communists too, will you let me live in a libertarian communist society? thats what anarchism is all about. tell you what, If you right wingers give us back the word 'libertarian', we will let you have the word 'liberal' back . .
Of course, if you want to be voluntarily communist, and all memebers of your group participated volutarily, and the land used was obtained lawfuly, there is no reason that you couldnt do that in a libertarian society. Due to the fact that would have to be voulantary im not sure if it could still be called communitst. However you could certainly do what you like so long as all participants were willing. If that is what anarchism is all about, why not support Libertarianism so that you can have the freedom to choose that. In fact as it is you may be able to do it to a some extent now. Comrade MOT says it well. The chief difference between socialists and libertarians is this. In a libertarian society anyone can be a socialist or communist as long as it is done voluntarily, with freely gained resources. In a socialist society libertarians would become slaves of the state-just like everyone else. "In a socialist society libertarians would become slaves of the state-just like everyone else." Not if it's a libertarian-socialist (i.e. anarchist) society, because there wouldn't be a state. How do Anarchist have socialism without a state to control it? How can you make people give up their private property? sure you might not have a state to enforce property rights, but people can always protect their own. Why do anarchists tend to support communists more than libertarians, when libertarians support minimal state, communists don't. Anarchy would not encourage people to be socialist, it would be just like libertarian society only rather than people trading property, they would fight for it, and steal it etc. Property is theft. What do we normally do with thieves? Right Libertarians are the sort of people who would give both the rich and poor the 'right' to live under a bridge if they chose to. They just come accross as a bunch of spoilt selfish sixteen year old brats with no social conscience or concept whatsoever.